It’s a night of candy, costumes and…caution? Halloween is full of fun times, but on All Hallows’ Eve many mishaps are possible. Not to worry. From slip and falls to fires to pet bites, your homeowners and renters insurance policies are there for you. O‘lanterns – Halloween is the fifth worst day of the year for candle fires. Thousands of home fires occur each year on Halloween, the majority ignited by decorations. If your pumpkin goes up in flames and causes damage to your property, a homeowner or renters policy will cover any losses related to the fire. Offenses – Will you be hosting a Halloween party this year? Will trick-or-treaters be visiting your home? If a guest or candy-seeking child is injured while on your property, your homeowners or renters policy will cover this as well. The liability portion will kick in and pay for treatment of injury or other damages. This also includes scenarios in which your puppy gets overexcited about all the ghosts and goblins and one of your trick-or-treaters sustains a nip from Fido. Ensure you have the policies in place for these potential incidents; as you prepare for Halloween this year, add one more item to your list: Get the candy. Get the costume. And get the coverage. Contact your insurance agent to verify your policies are current and include the necessary coverage for this season. With this settled, you can enjoy the treats – and be ready for the tricks. It’s October 29 … Happy National Cat Day, Fluffy! Give your cat a toy packed with catnip. You’ll enjoy watching his excited play as much as he enjoys playing. 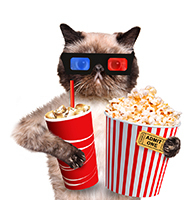 Watch a cat movie with your cat. Maybe you could let her choose which one. Their favorites are usually the ones where the cat outshines a dog. Tuna. Need we say more? The Internet explodes with cat videos on Cat Day. Do some random viewing … with your cat. Who knows? He might find the antics of other cats and kittens entertaining too. Too much? At least give your whiskered friend an extra snuggle on October 29 (and maybe an extra treat or two). And if you don’t already have a purrfect pet, it’s a great day to adopt one! Not Up for Carving? Paint Your Pumpkin! Don’t panic if you didn’t have time to create elaborate costumes for Halloween or turn your yard into a haunted house or showcase of fall beauty. There are simple things you can do to prepare for October 31, with materials that are easy to access. Pumpkins don’t have to be jack-o’-lanterns – smaller ones can be displayed on a tray with jars of jam or colorful plants. But if it’s all about the jack-o’-lantern for your family, at least eliminate the mess and the concerns about using sharp knives around the kids: turn your pumpkins into chalkboards with chalk paint. After thoroughly scrubbing your “canvasses,” cover part of the pumpkin with chalkboard paint. Make sure you apply several coats of paint and let it dry between coats. Once dry, use your “pumpkinboard” to draw family caricatures or scary faces, or write messages for trick-or-treaters. You can use pumpkins of various sizes and shapes, and white pumpkins with black paint will lend a ghostlike presence to your Halloween décor. And, if you’re missing the flickering candlelight in carved pumpkins, use a small electric candle to shine on your artwork. The ghosts and goblins will love it! Uber has exploded into popularity as an affordable option for passengers and a side job for extra cash for drivers. Passengers in need of a ride simply hail an Uber from their smartphone app to arrange for a car to pick them up. Local drivers respond to notifications from the app and pick up passengers in their own vehicles. But perhaps it’s not as uncomplicated as it sounds: Uber does not own the car, and the drivers are not directly employed by Uber. So how exactly does the auto insurance work? For those who may be interested in driving for Uber or a similar company, note that vehicle insurance policies are usually written for personal coverage and likely will exclude driving for hire. Therefore, Uber drivers may need supplemental commercial insurance for proper coverage. That said, Uber provides some coverage for drivers, and liability coverage to protect passengers and others. While the Uber app is on, the drivers are protected. For passengers, the Uber liability insurance covers them when they step into the vehicle and applies until they get out. Indeed, Uber-type services typically have huge liability policies that cover claims personal auto insurance wouldn’t cover. However, the policies may not cover damage to drivers’ cars. So drivers likely will also need a solid personal auto insurance policy. Before transporting passengers for an Uber-type service, be sure to review your auto insurance with your agent. The kids will love this scary dish! Place the sliced sweet potatoes in a bowl with olive oil, thyme, salt, and pepper. Toss to coat. Cover and microwave about 6 minutes or until slightly softened but not fully cooked, stirring halfway. Using tongs, place slices on a cookie sheet and use a cookie cutter to cut out Halloween shapes or a paring knife to make jack-o’-lantern cutouts. Bake for 10-15 minutes or until cooked through and browned. Place on a serving dish and top with crumbled bacon.